Necrosis was formed in 1992 in the Flanagan garage with Brian on guitar and Gary on bass/vocals. After writing a few tunes they grabbed friends Phil Peseri on bass, Erik Styeskal on guitar, and Sal Barbieri on drums. The vocals were then split between Gary and Brian. 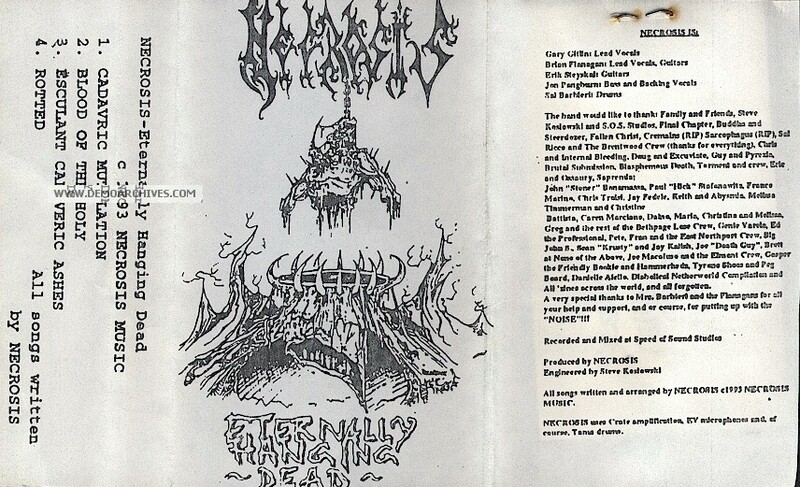 After two very poorly recorded demos they went back to the studio and released Eternally Hanging Dead in 1993. This demo propelled them into the Long Island death metal scene head first. After playing everywhere all the time the band had a few lineup changes. Phil was replaced by Jon "Spiderfingers" Pangburn on bass and they picked up Willer Lora from Long Island's Cross Fade (not that weak band you hear on the radio) who replaced Erik on guitar. 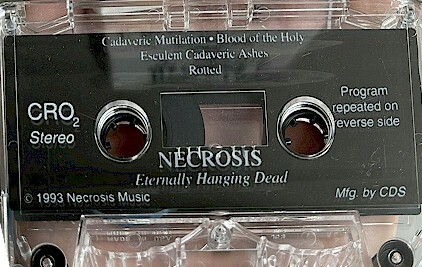 With the new lineup and letters from Eric Wagner of Necrosis (Rhode Island) they decided to change the spelling to Necrosys. In 1997 Necrosys went to Legend Studios to record their full length cd "Symptoms". Unfortunately the recording never surfaced due Ed Kelly from Witchhammer Records who fled to England with the final recording as well as the finished recordings from Tyrant Trooper (CT), Infestation (Mass. ), Drogheda and few others. Second version of the cover. Two Covers exist. This is the original. Xeroxed covers. Pro printed tapes. Came with lyrics.